Treat Your Wrinkles for Younger-Looking Skin! Aging is just a fact of life and we can’t escape it as we look in the mirror every day. From a science perspective, as we get older, our body produces less collagen, which leads to skin laxity, crow’s feet, laugh lines, and other signs of aging. Unfortunately, all that expensive face creams will not help to produce more collage and diminish your wrinkles. At Noydeen Beauty, we take science based approach to aging and wrinkle reduction. Using laser light therapy, medical provider and his team treat wrinkles with high tech solutions that non-invasive and are effective at firming up sagging skin and diminishing wrinkles by using heat to boost collagen production. This helps to restore a more youthful, refreshed appearance. During your laser session, the Noydeen Beauty team precisely delivers pulses of light, increasing the skin’s production of collagen for a smoother, suppler appearance. The entire procedure can be completed in as little as 15-30 minutes. With quick and powerful flashes of light. The light energy then penetrates below the skin’s surface, to address facial wrinkles. It’s a safe, effective and quick treatment that can have a dramatic impact on so many people struggling with sagging skin and we are thrilled to offer this innovative treatment to our clients. 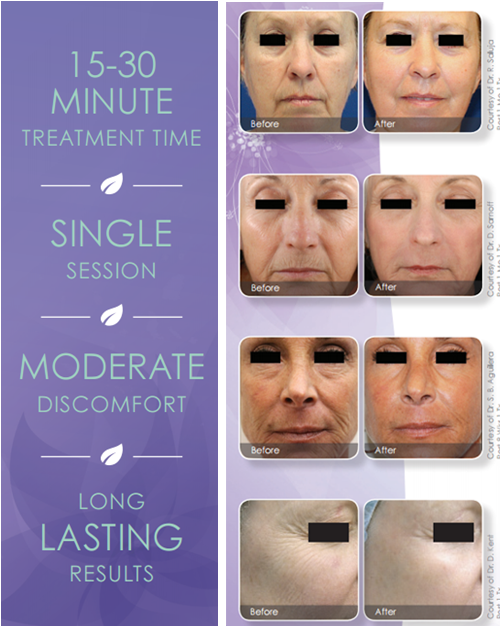 Our patients are impressed to see skin tightening improvements in their condition after a series of treatments. Tighter looking skin is easier than you think with laser treatments. In just one treatment you can have a more youthful looking appearance with improved tone and tightening of your skin. Achieve long lasting results without the pain or side effects associated with a more invasive surgery. Best of all, you will still look like you – only better. This laser light technology uses microbeams of energy to create areas of affected tissue that extend through the epidermis into the dermis. This triggers the body’s natural healing process to create new, healthy collagen. You will have an improvement in both tone, laxity and texture, resulting in younger looking skin. Treatment plans can be adjusted to fit everyone’s lifestyle – speak to your provider regarding desired downtime, comfort, and results.